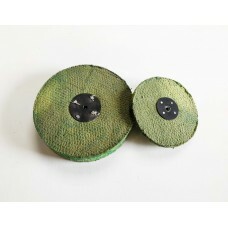 Green medium hardness treated sisals mops. This classic green treatment has been a popular sisal mop for the last 30 years in the polishing and metal finishing trades. Slightly harder than a standard dry sisal. Leather washer centre for taper spindle.